I’ve always wanted to have a natural birth. Never did I think that I would want it at home and in water. My first two children were born in the hospital. 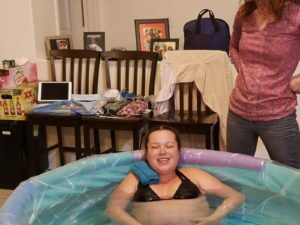 My doctor was amazing and knew exactly what I wanted… No Epidural. The first was work. Three days in labor and I was induced. So, I got the Epidural to help me thru the last day. The second was great. I was at home for the first 7 hours of labor and then I went to the hospital for the other 7. All was great at home, blood pressure was normal, and I was focused. Once I got to the hospital it all went down hill. Blood pressure went ip and I couldn’t concentrate on my body and what it wanted to do. I got the epidural, because the nurse forced it on me, but it didn’t work. Which was good for me because I didn’t want it. I felt every little pain and my body telling me that I had to push. After all of this I realized, I can do this at home. I can really do this. Forward two years later, my husband wanted to try for one more. I agreed but under one condition, to have the baby at home with a midwife. He agreed and my research began. April was the first one I found nearest to me. I checked reviews and her background. I knew she was perfect. And boy was I ever right. 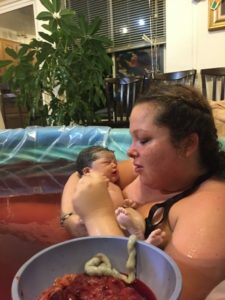 I had done so much research on at home births. I don’t know how many times I watched The Business of being born and more Business of being born. 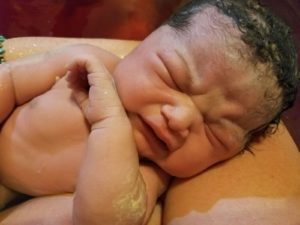 I was convinced I wanted her as my midwife but my husband was different. He was more nervous and concerned about the process. Our first consultation was great. She answered All his questions and concerns. She made him feel really comfortable with this option. He was still nervous. April focused on me and the baby on every visit. Amy, her assistant, Doula and midwife in training, was amazing as well. They are both very patient and happy to answer every question. They provided all the information I needed to prep for the big day. Week 40 came and went, and no baby. Naomi wasn’t quite ready yet. Bu week 41, April help get the ball rolling on the contractions. I had an appointment and with her help my contractions started around 1pm and they were stronger and closer together. I had the tub delivered and set up. April and Amy came around 4pm because the contractions were around 4 minutes apart and about a minute long. I love the fact that they let me do whatever I wanted. Walk, sit, drink fluids, eat and/or get in the tub. I was so comfortable being at home and so was my husband. The pain was strong but I was able to breath thru each and every one. They were so amazing with helping and encouraging me. By 8pm I was so tired and all I wanted to do was take a quick 5 minute nap. I just remember hearing April say You are doing so great. You are almost there. With every contraction I pushed and the closer I got to seeing my baby. The pain was in my hips and lower back. I breathed thru each contraction. Before I knew it, April and Amy were getting ready for Naomi. Although I was tired, I got all my strength to push this baby out. In the mist of me concentrating on the contractions and pushing, I hear You are doing amazing. Deep breaths, just like that. I felt her head and then the pop. Her head came out and with another push her shoulders and body. My princess was finally here in my arms. It was the most amazing feeling in the world knowing that I did this. I was able to get up and walk to my bed, hold my baby and eat. I was never able to do that at the hospital. It was great not having nurses come in and out, sticking fingers up you, waking you up to check you and the baby, and telling you how to care for your baby. These are the moments were you need peace and quiet and take in the joy and excitement of your baby. The ladies checked me and the baby. They cleaned up and called to have the tub picked up. They answered any questions all my questions and said good night. I saw April two days later for baby check up at home. All was good. This was by far the Most Amazing Experience of my life. In the beginning I was pumped and knew I could do this by my last two weeks I was doubting myself. Hahaha! My husband, who was on the sidelines watching, was so amazed by the whole experience. He said that he wished we would have done this with our first two children. 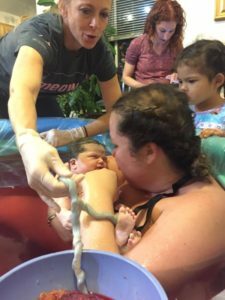 I highly recommend a home birth to everyone. Thank you April and Amy for this Amazing experience. You both have such beautiful souls.